Who was J.P.W. Stuart, and why does it matter? Well, the Veblen House was not built by the Veblens, but was originally brought to Princeton in pieces around 1920, by a man named Jesse Palmier Whiton-Stuart. Some reports say it was moved from Morristown, NJ, others mention New York. When I told a builder friend that the original owner was a Stuart, he said that there was a prominent New York City family by that name. Some preliminary internet research suggests that Stuart was indeed a man of means, with prominent friends and interesting pursuits. Though the research is just getting underway, it's likely that J.P.W. Stuart was born into a prominent NY family, and may well have married into another. In 1905 (the year Oswald Veblen was hired by Princeton University), Stuart married Mary M. Ogden, daughter of John Ogden. 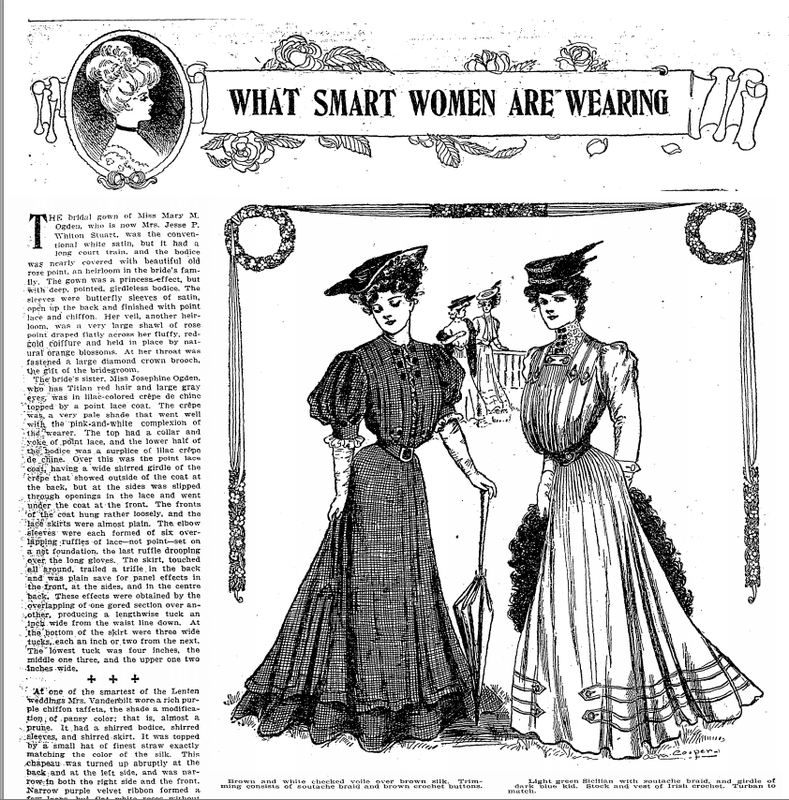 Mary's wedding attire is described in detail in a NY Times article that also mentions what Mrs. Vanderbilt was wearing, at a different wedding that weekend. The Ogden name appears to date back to the Pilgrims. When one account gave Stuart's father's name as Robert, there was the tantalizing possibility that his father was Robert L. Stuart, who made his fortune in the sugar business, and who with his wife and brother were deeply involved in philanthropy, including large donations to Princeton Seminary and Princeton College. There's a Stuart Hall over on Alexander Street. They collected Hudson River School art, and Robert L. was president of the NY Museum of Natural History for some years. But our Stuart takes his name from Robert Watson Stuart, whose background is as yet unclear. 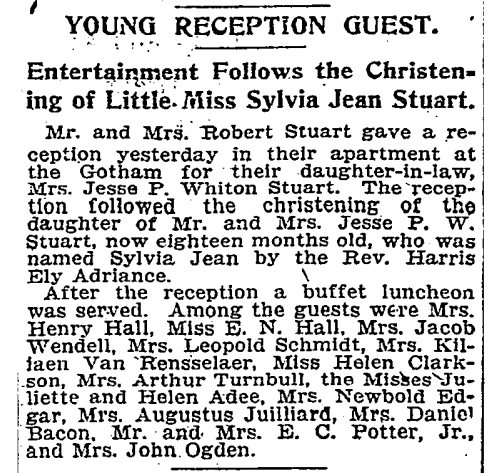 In 1908, Jesse and Mary had a daughter, Sylvia Jean, whose christening was attended by some prominent-sounding members of NY society. In 1964, Sylvia pops up as Sylvia Olcott, living in Tucson, AZ. Perhaps it would be asking too much for the poet Ogden Nash (Ogden was his middle name) to be related to both Mary Ogden and the brilliant mathematician John Nash, Jr, who came to Princeton when Veblen was still around. On the other hand, the Mrs. Augustus Juilliard mentioned as having attended the christening of Mary and Jesse's daughter may well be the wife of the founder of the Juilliard School of Music. Other articles from that time document a J.P.W. Stuart who was an excellent marksman. He channeled his talent into winning pigeon shooting contests. If that was our J.P.W., then the dovecote shown as standing near the Veblen House in the 1950s (on the right in this photo) may date back to Stuart's time. It also suggests that the transfer of ownership of the house from Stuart to Veblen is symbolic of the shift in views of wildlife over the course of the 20th century, as birds became something to watch rather than to shoot. Veblen excelled at both math and marksmanship while growing up in Iowa. He combined these two talents by leading U.S. efforts to improve the accuracy of artillery during the world wars. All in all, this preliminary foray into the story of Stuarts suggests yet another rich vein of history awaits appreciation out at Herrontown Wood. From small seedlings, giant chestnuts grow. 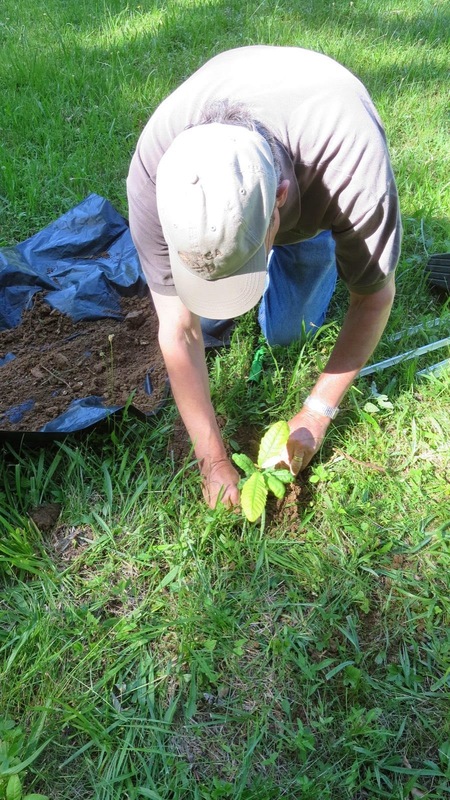 Thanks to local tree expert Bill Sachs for supplying four chestnut seedlings and the "grow tubes" to protect them from the deer. The seed he grew them from, obtained from Connecticut, is the product of decades of breeding to develop native chestnuts resistant to the introduced chestnut blight that devastated the American chestnut a century ago. Terhune Orchards provided Bill with room in their greenhouse to grow some 80 seedlings, which he has been planting at various sites in the Princeton area and in Pennsylvania. The product of our labors doesn't really look like new trees. 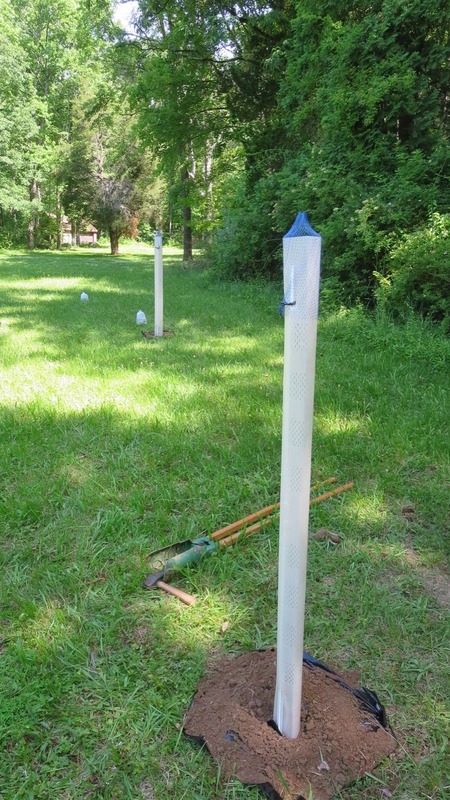 The "grow tubes" are experimental, designed to provide the seedling protection and sufficient light, while discouraging lateral branching. 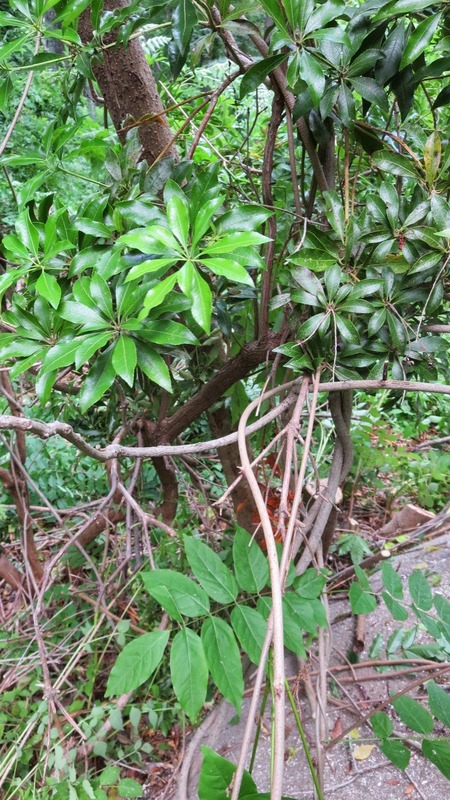 For more posts on the initiative to reintroduce native chestnuts to Princeton, go to PrincetonNatureNotes.org and type in "native chestnut". We had another highly productive and rewarding workday this past Saturday at the Veblen House, organized by the Rotary Club of Princeton as one of their service projects. 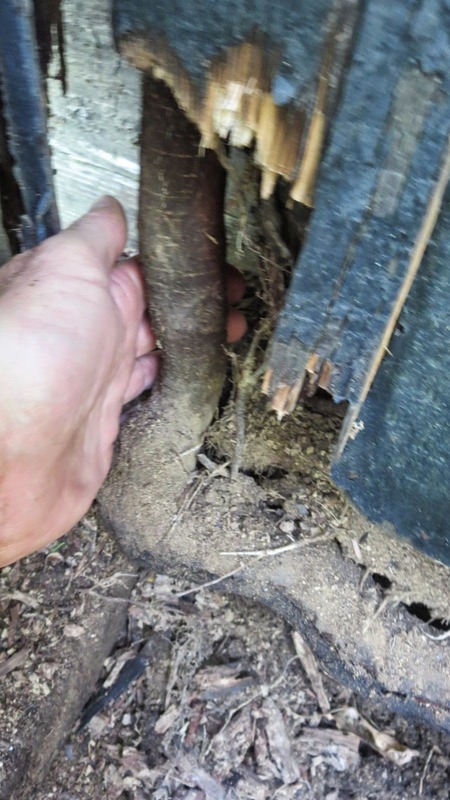 The focus was on removing invasive vines from house and grounds. It was a real pleasure to have the help of Bob Wells, and hear his many stories about living there with his family from 1975 to 1998. Also in the photo are architect Ahmed Azmy and neighbor John Powell, both Rotary members and strong supporters of rehabilitating Veblen House. 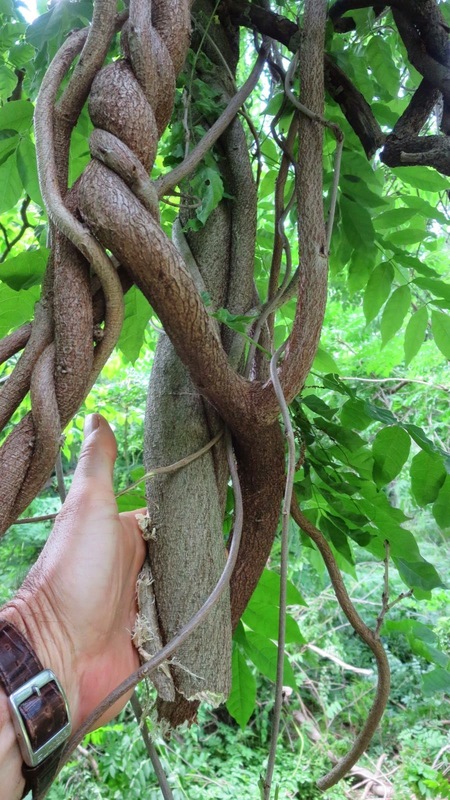 John was wielding loppers against the wisteria, which had begun back in Elizabeth Veblen's day as a pretty ornament for the trellis, but which has spread into the surrounding woods. 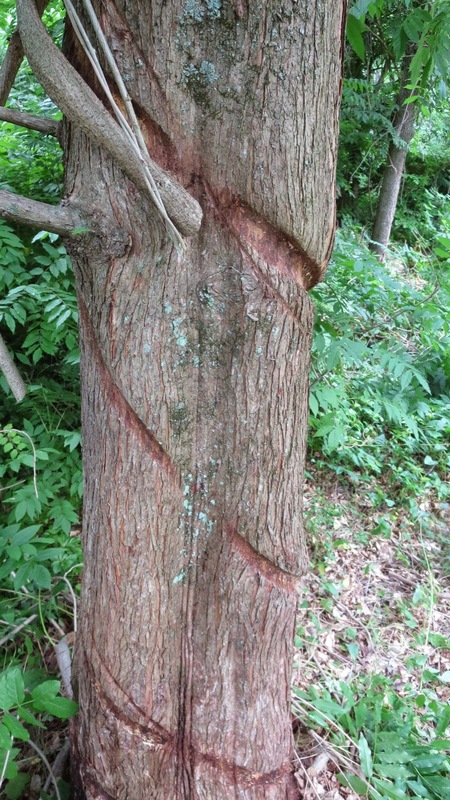 You can see the strangle hold it takes on trees, in this case a dawn redwood planted by Bob decades ago. forming a trunk almost as large as the flowering dogwood it was mobbing. 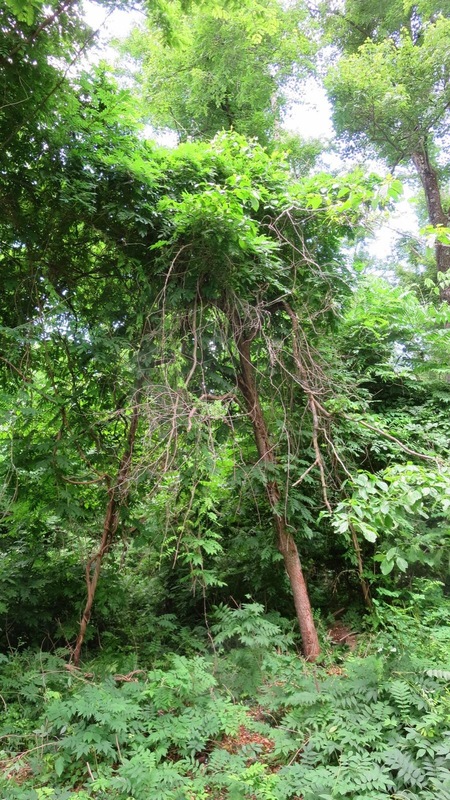 We speculated whether the dogwood would recover now that the vines have been cut. I took the more optimistic point of view, noting various branches still showing healthy leaves reaching out beyond the smothering embrace of the vine. This Pieris, now liberated, may live to grow another day. Bob told us that Elizabeth's fishpond, now visible again with the vines removed, used to hold water and was stocked with goldfish. Meanwhile, vines have been showing interest in the house. 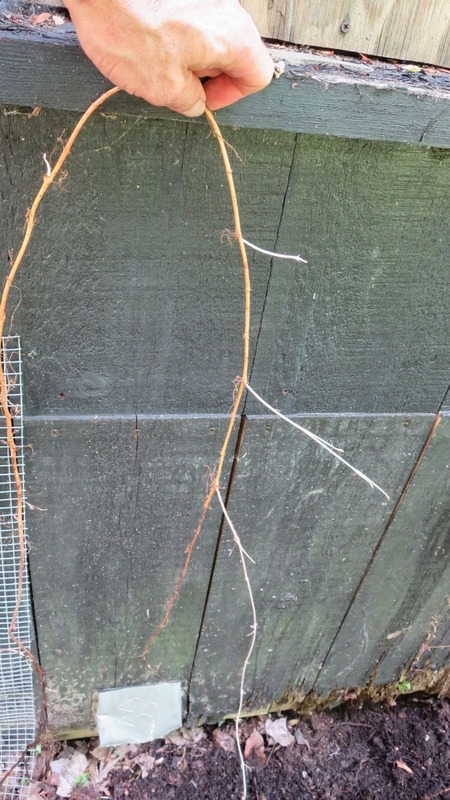 This vine, possibly a Virginia creeper, has a stem growing up inside the wall. Not ideal. A snip with the loppers should have been applied years earlier, but at least that vine won't be growing any farther. It's reassuring at such times to remember that builders have consistently found the building to still be in solid condition and worth saving. A much smaller vine, Japanese honeysuckle, had headed into the basement. You can see the white shoots that indicate the lack of sunlight. It took me back to 6th grade science class, when we grew one set of bean plants in a closet and another set on a windowsill. Several weeks later, everyone was surprised to find that the ones grown in the closet were much longer, and lacked any chlorophyll. The lack of sunlight stimulates the plant to invest what energy it has in length, the better to eventually reach a source of light. The moist ground made digging soil away from the foundation relatively easy. A backhoe will be needed to do a more thorough regrading, but hand shoveling allows for some serendipitous discoveries, like a beautiful buried boulder that used to serve as a step for the side door. We ended the workday with pizza, basking in the beauty of the day and the peacefulness of the Veblen House grounds. Thanks to the Rotary Club of Princeton for the support and talent it brings to the Veblen House project. We call it Herrontown Wood, but this post is about Herrontown Rocks. What makes this nature preserve extraordinary is the layers of meaning to be found there. Begin with the soil, which was formed out of and influenced by the underlying diabase rocks. 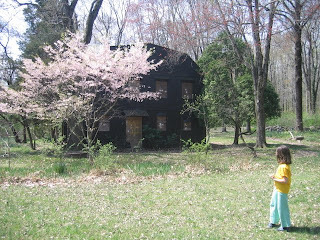 Add the woodland, of course, whose botanical richness is so well preserved in part because the many rocks discouraged any plowing back during Princeton's agricultural era. (Plows obliterate the roots, seedbank, microorganisms and complex structure that comprise a soil's biological memory.) Add the wildlife drawn to the long corridor of forest, where stubborn boulders discouraged development long enough for open space groups to achieve permanent protection. Add to that the cultural history that endures in rock walls, rock foundations, quarried stone, and the farmstead and house of Oswald and Elizabeth Veblen, with their multifaceted legacy of international import. Along with the many roles the rocks have played in the past two hundred years, there is the story of how the rocks got there in the first place. It's told by the great majority of rocks and boulders never piled in rows or split apart. One important point to grasp from the get go is that the glaciers did not form the Princeton Ridge. The glaciers' southernmost extent coincides with where Manhattan is today, some distance to the north. What forces, then, created this long ridge of boulders? A couple weeks ago, I joined my neighbor Jon Johnson on one of his morning walks with his dog Cocoa in Herrontown Woods. 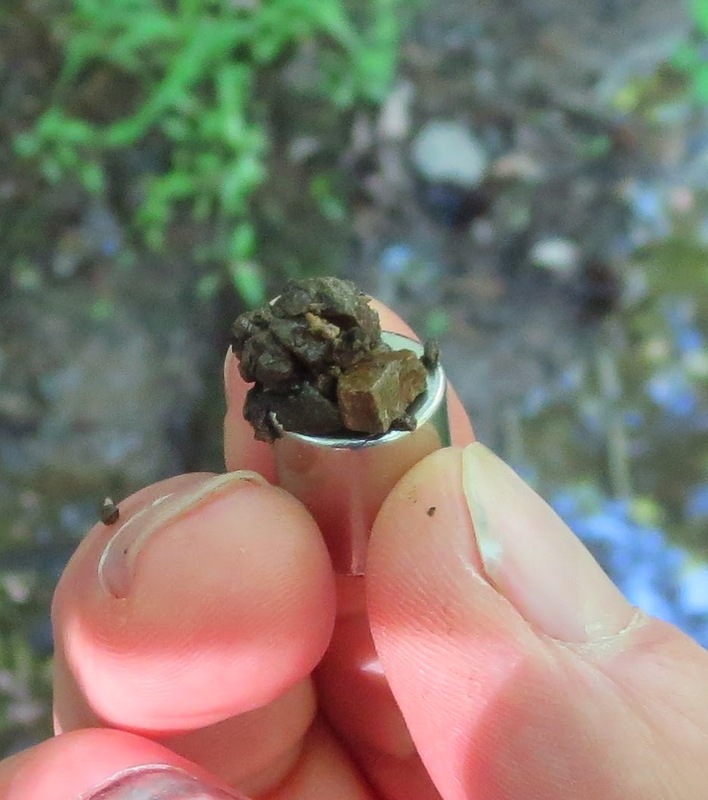 His expertise is in groundwater, but he's been studying the rocks he finds in the streams and along the trails, and sharing some of what he's discovered with students at Little Brook Elementary, where his kids go to school. He begins by asking the kids a simple question. 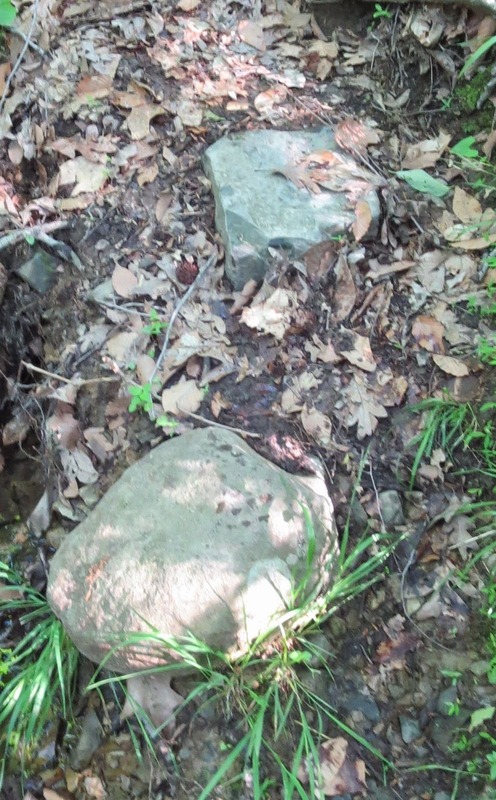 Why is one stepping stone along the trail rounded, while the one next to it is square? Why are some boulders and pebbles magnetic, while others are not? And why are some rocks rough textured while others are more smooth? The story he tells goes back to the time of Pangaea, that is, when Africa and America were all one land mass. As the continents pulled apart, a basin expanded between them, received sediment from eroding land masses on either side, became interrupted by upwellings of molten rock that rose through the sedimentary layer, cooled into diabase and subsequently eroded to form the boulders we see today. Jon showed how Herrontown Wood tells this story through the geologic transition visible in the park. 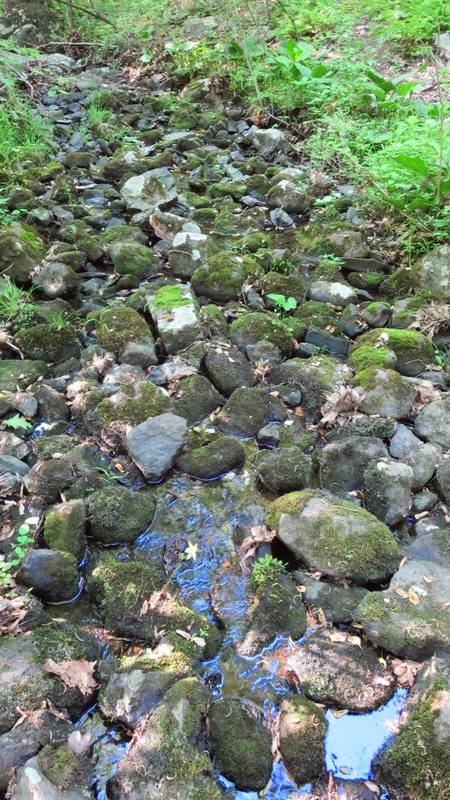 If you walk west from the parking lot (the one off of Snowden Lane), then follow the main creek upstream, you'll see the rocks in the stream are at first squarish. This is the sedimentary rock. Some are rougher than others, suggesting that they may have contained fossils that lost their shape when heated by molten diabase. You can see in this photo a magnet stuck to a boulder. The magnetism comes from magnetite, which usually makes up only 2% of the diabase, but may comprise up to 20% of some rocks. Even different layers of the same boulder can differ in the presence of magnetite, which explains why a magnet may stick to one part of a boulder, but not another strata a few inches down. To find the areas of the park with the most magnetite, Jon has played the role of prospector, walking up one or another tributary of the stream, testing the pebbles for magnetism. When my kids were younger, we would go to Herrontown Wood and find joy in climbing the rocks. The main story we saw was how the rocks got bigger as we walked up the hill. Now, thanks to Jon, we can go beyond aesthetics and size, and more deeply appreciate these rocks that have served Herrontown Wood in so many ways. Will the Real Veblen House Please Stand Up? They're both still standing, but which is which? To tell the truth, people who leave not one but two houses in the public trust really should consider including an endowment for clear labeling. On your left, dressed in black (it used to be a two-tone with the second floor a chestnut brown color), is Veblen House, the 1920s prefab in a lovely setting where the Veblens lived. On your right is the cottage, more commonly seen because it's at the intersection of two main trails in Herrontown Wood. 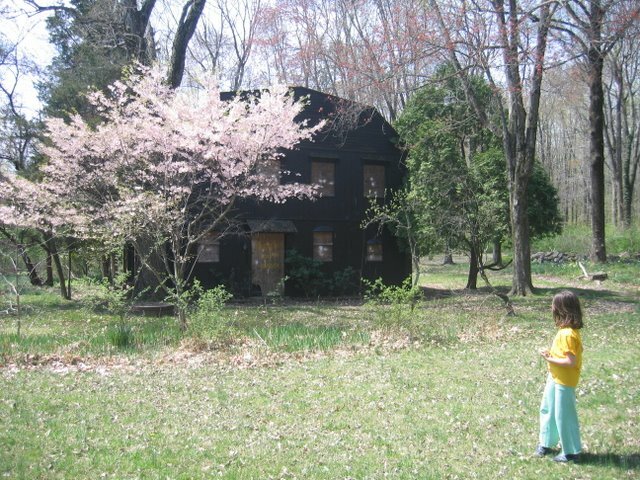 This 1870 Dauer farmhouse was used by Veblen as a study, beginning in the 1930s. 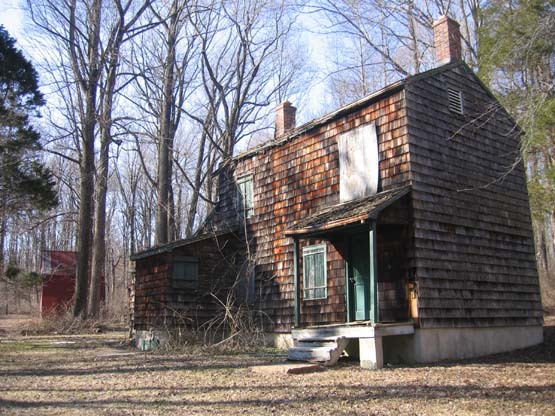 Though it isn't "Einstein's house", as one rumor had it, Einstein would visit his friend and colleague Veblen, and spend some quality time surrounded by nature and the simplicity of this rustic farmstead. The Trenton Times ran a front page article today, Sunday, on the Veblen House and the Rogers House--another county-owned historic building that has fallen into disrepair. (It's early morning, and I first wrote "fallen into repair". Wouldn't that be nice.) It's a well-written article with a big photo of the house in the print version. 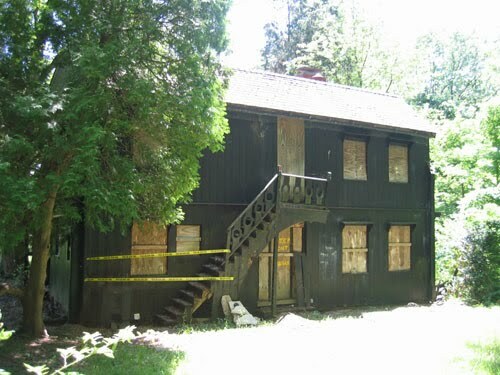 Note that the online version has one photo of the cottage that may still be labeled "Veblen House". The cottage is the 1870 Dauer farmhouse that Veblen acquired in 1936 and used as a study. It's just a few hundred feet from the house, which they bought some years later. If you click on the other online photos--there's a series of twelve--you'll find photos of the house as well. You can find information on this website about the Veblens, the house and cottage, and the initiative to save them by clicking on the various tabs. Below are a couple links to overviews of the site, and what it looked like when the Veblens were living there. For more info, I can be reached at stevehiltner(at)gmail.com, or give me a call at 609 252 0724.